Question 1 What is the nature of graph for a uniform speed? Question 2 Name the quantity which is measured by the area occupied under the velocity-time graph? Question 3 What does the slope of speed-time graph indicate? Question 4 What can you say about the motion of a body if its displacement-time graph is a straight line? Question 5 What can you say about the motion of a body if its velocity-time graph is a straight line? Question 6 Name the quantity,the slope of whose graph give Speed? Straight line graph between distance and time tells us that body is moving with uniform speed. Slope of distance time graph indicates speed. The distance time graph for a non-uniform motion is a curved line(parabola). If a body moves with a non-uniform speed then its motion is said to be accelerated.It also represents distance time graph with accelerated motion. 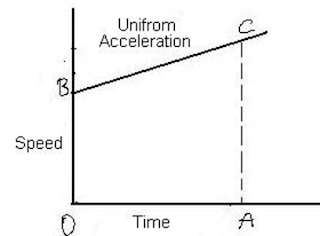 a)Speed time graph for a body moving with constant speed(no acceleration) is a straight line parallel to time axis. We can find the distance travelled by a body in a given time from speed-time graph. The velocity time graph of an object moving with constant velocity is a straight line parallel to time axis. 1)When a body moves with uniform acceleration,its speed changes by equal amount in equal intervals of time. Speed time graph for a uniformly changing speed will be a straight line. In a speed time graph the acceleration is given by slope of the graph. 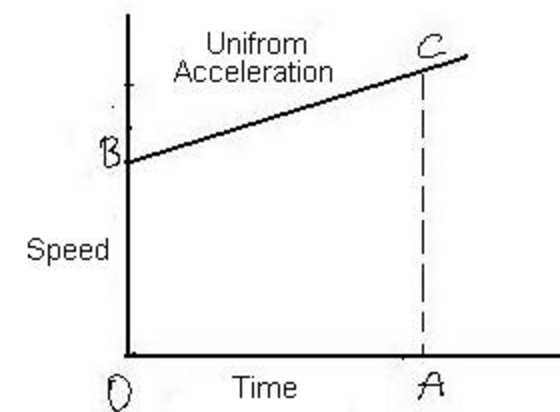 The distance travelled by a moving body in a given time can be calculated from speed time graph. 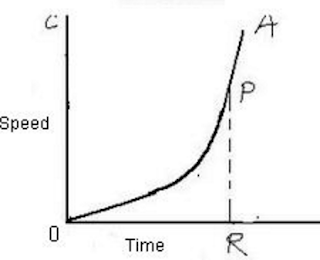 In a speed time graph of a body a straight line sloping downwards indicates retardation. Speed time graph when the initial speed of the body is not zero. The distance travelled by the body in this case is equal to the area of trapezium OBCA. When the speed of a body changes in an irregular manner,then speed-time graph of a body is curved line. nice graphs help me a lot….